The Apple store and iOS optimize the installation of iOS, tvOS, and watchOS apps by tailoring app delivery to the capabilities of a user’s particular device. This optimization is called app thinning. App thinning lets you create apps that use the most device features, occupy minimum disk space, and accommodate future updates that can be applied by Apple. Learn more about this optimization process on Apple’s Developer Library page on App Thinning. See in Glossary (those that are needed from application startup) from Assets which may be optional, or which appear in later levels of your game. These additional Assets are called AssetBundles. 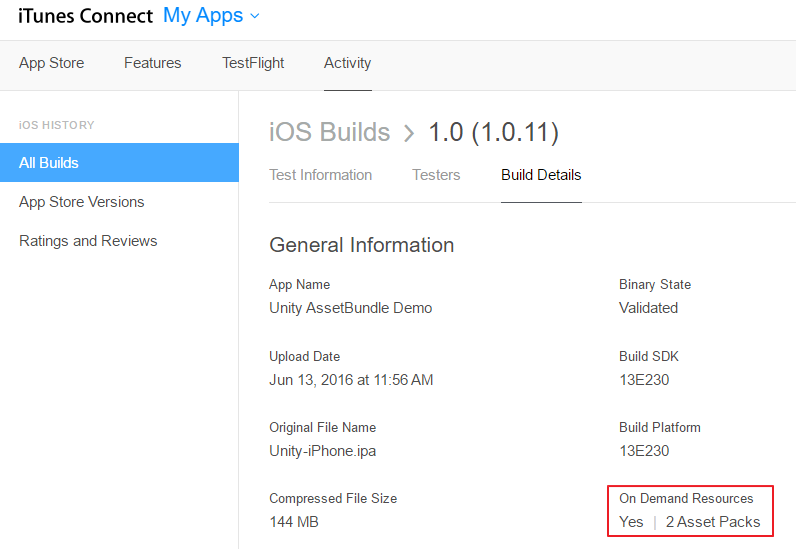 They’re available across all Unity build targets, but extra steps must be taken to enable them to be hosted via the App Store. See in Glossary. This means that all your scripting logic must reside in the main application. Apple recommends that an AssetBundle be no larger than 64MB in size, to reduce loading time (particularly over-the-air) and minimize the amount of storage space used on the device. 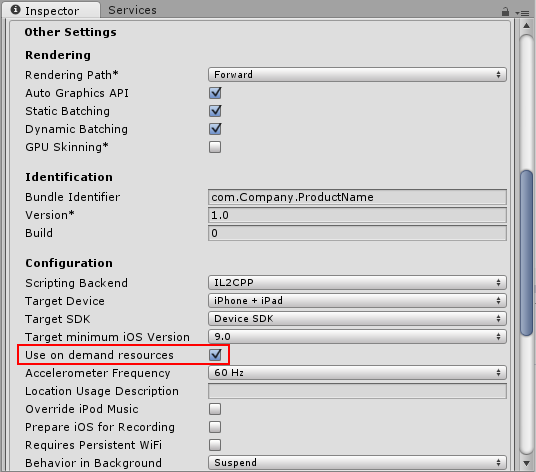 To set up your project for ODR, first check that your build type is set to iOS. In the menu bar, go to File > Build Settings. See in Glossary window, open Other Settings, navigate to the Configuration section, and enable the Use on demand resources checkbox. First, create a new folder to group the Assets you want to place into an AssetBundle. To do this, right-click inside the Project window and go to Create > Folder (or click Create > Folder in the top-left of the Project window). Select the Asset files you wish to add to the AssetBundle, then drag-and-drop them into your new folder. When creating an AssetBundle, you need to assign it a tag, which is used as an identifier when requesting the AssetBundle download. It’s good practice to create a label that matches the bundle’s filename; this ensure a unique label, and makes it easier to recognise when you are working with it later. To create or assign a tag, select your new folder and navigate to the Asset Labels section at the bottom of the Inspector window. Click the left-hand drop-down menu, select New, and enter the name of your new label. Note that AssetBundle labels must be lower-case. 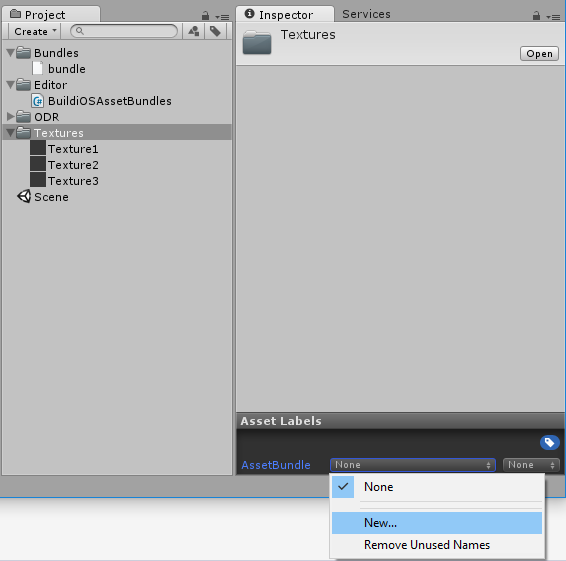 To generate the new AssetBundle file, the new label must be referenced in an Editor script. To create an Editor script, create a new folder inside the Project window called Editor. Right-click on the Editor folder and select Create > C# Script. Name the new script BuildiOSAssetBundles.cs. In this example, the Textures folder has been given the label textures. The new script BuildiOSAssetBundles.cs has been created in the Editor folder. Open BuildiOSAssetBundles.cs and copy in the code below. In this example, the label textures has been used; change this throughout with the name of your label (in lower-case text). Note that this example uses uncompressed bundles; however, this is not a requirement for app thinning. 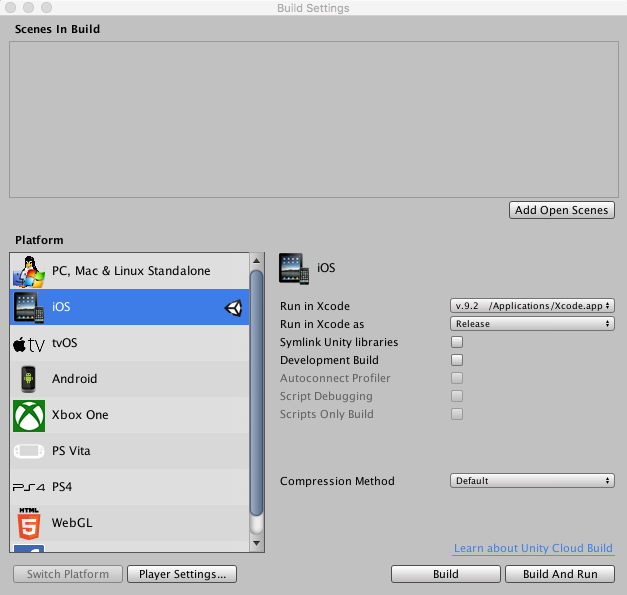 The whole code sample creates a new menu in the Unity Editor menu bar. Go to Bundle > Build iOS AssetBundle. This generates the AssetBundles in the ODR folder. The following script downloads the textures ODR Asset Bundle, assigning it to the public member TextureBundle. Place this somewhere in your project. The next step is to generate an Xcode project, build an .IPA, and upload it to iTunes Connect’s TestFlight. As part of the TestFlight processing procedure, the embedded ODR AssetBundles are removed from the app and hosted on Apple’s servers, ready for downloading. 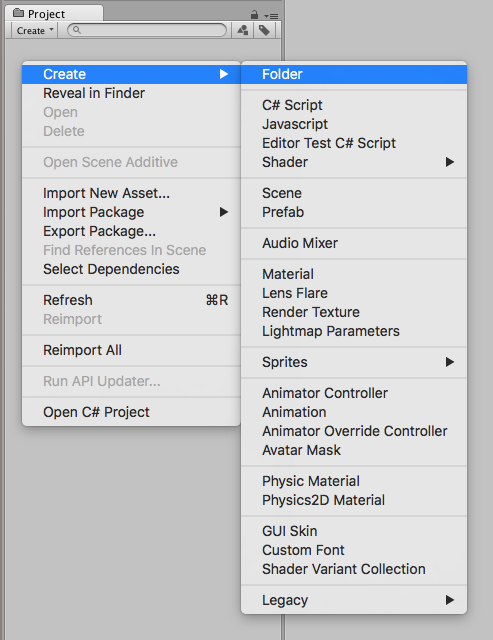 Before you build the .IPA in Xcode, check in XCode’s Build Settings to make sure that in the Assets section, Embed Asset packs In Product Bundle is set to No, and Enable On Demand Resources is set to Yes. App slicing follows a similar process to on-demand resourcing, allowing you to dynamically download Assets according the specification of the device the app is running on (for example, to download high-resolution Assets for retina iPads, and low-resolution Assets for smaller devices like iPhones and the iPad Mini). This is achieved by defining AssetBundles, with the added provision of variants. This way, you can decide at startup which variant to use, and automatically append this to the Asset file name upon download. 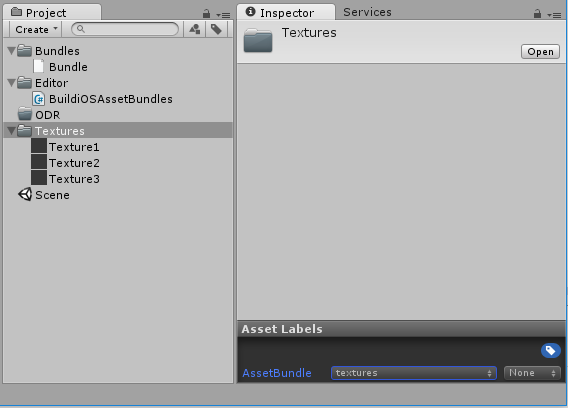 To create a Variant, click on your new folder and navigate to the Asset Labels section at the bottom of the Inspector window. Click on the right-hand drop-down menu, select New, and enter the name of your new variant. Note that AssetBundle variants must be lower-case. The new variant must be referenced in an Editor script. To create an Editor script, create a new folder inside the Project window called Editor. Right-click on the Editor folder and select Create > C# Script. Name the new script BuildiOSAppSlices.cs. Copy and paste the code below, replacing the example label (“textures”) and variants (“hd” and “sd”) with your own. In this code example, multiple folders are referred to: one containing HD textures, and one containing SD textures. These have been given the variants “hd” and “sd” respectively. 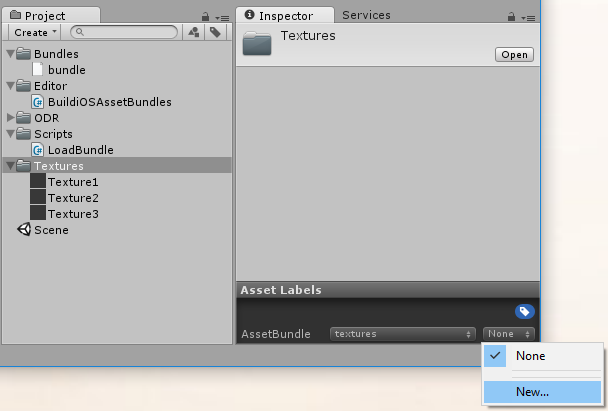 This creates a new menu in the Unity Editor menu bar called Bundle. Click this and select the only item in the list, Build iOS App Slices. This generates the AssetBundles in the ODR folder. 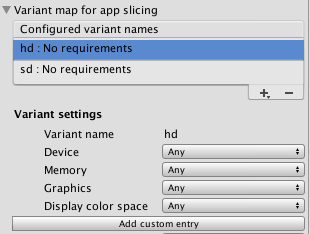 You can now see and modify variants in Player Settings > Other Settings > Configuration in a Variant map for app slicing drop-down menu (the menu is only visible if Use on demand resources is enabled in the Player Settings). To learn more about AssetBundles and on-demand resources, see Unity’s AssetBundle Manager demo project, hosted on Bitbucket. The landing page offers a comprehensive description of how to use and tweak the demo.